There are political prisoners in Honduras. There is a dictatorship in Honduras. The United States supports the dictatorship and contributes to the violence, repression, and destabilization of Honduras. Faced with devastating levels of violence and instability, people are fleeing Honduras and seeking political asylum in the US. If they reach the US, then they are held in ICE custody. This has also proven to be deadly – just last week, Roxana Hernandez, a transgender Honduran woman, died in ICE custody after fleeing persecution in her homeland. More than four months have passed since Edwin Espinal was detained by the Honduras government. He is currently a political prisoner at the supermax prison La Tolva, along with Raul Alvarez. Edwin has been persecuted by the Honduran government since the coup in 2009. Only after four months of national and international pressure did the prison director at La Tolva finally approve a visit from a human rights delegation from Canada and the United States. It is important to continue fighting for the freedom of the remaining political prisoners and to support the others that have been freed but await charges. 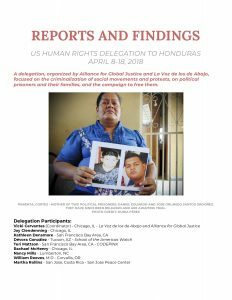 From April 8-18, 2018, La Voz de los de Abajo and Alliance for Global Justice organized a delegation to Honduras at a time when there were 21 political prisoners that were targeted and persecuted following the widespread public protests responding to the fraudulent presidential elections in late 2017. While many of the political prisoners have been freed, the stories of their persecution are emblematic of the repression that pervades the lives of everyone in Honduras. Opposition to the regime is met with persecution, imprisonment, and even death. People may be forced to remain silent, but their streets scream it loudly – the people oppose the Juan Orlando Hernandez regime. They oppose the corruption, militarization, and collective punishment the regime imposes on them. After weeks of work, a report with the detailed findings from the delegation is available online. Please take a look and share the report widely.